Can the war-torn region be stabilized? Plagued by conflict, poverty and poor governance, the Horn of Africa is arguably the most troubled corner of the world's poorest continent. In desperately poor Somalia, an 18-year civil war has forced more than a million people from their homes, leaving behind a safe haven for pirates and, possibly, Islamic terrorists. In Ethiopia, an increasingly authoritarian, Western-backed government has jailed opposition leaders and clamped down on the press and human rights activists. In tiny Eritrea, a government that once won the admiration of legions of Western diplomats and journalists for its self-sufficiency and discipline has become an isolated dictatorship. The recent withdrawal of Ethiopian troops from Somalia and the election of a moderate leader to the country's transitional government have raised international hopes that the lawlessness there will be brought under control. 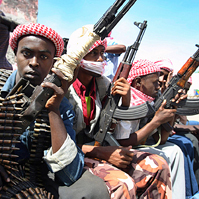 But Somalia's new government faces an insurgency from radical Islamists and worldwide pressure to stop the increasingly aggressive pirates who terrorize cargo ship crews off Somalia's coast and find refuge in its seaside villages.